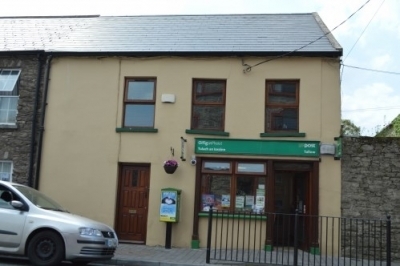 Tallow Post Office - Tallow, Co. Waterford, Ireland. Your local Post Office is at the heart of your community. It provides a wide range of services, many are new and of which a lot of people are unaware. If these services are not used it is highly likely that in the future your local Post Office could close. An Post is one of the most powerful brands in Ireland today, ranking number 3 as the most reputable company in Ireland. You the customer can rest assured that privacy and honesty is one of its leading attributes with highly trained and efficient employees. Please use your Post Office services and help to keep your Post Office open! Registered, Express and Standard Mail. Mailminder Service for holiday periods. Redirection facility - redirect your mail if moving address. Passport Express - Apply for your Passport. All main utility bills e.g. phone, gas, electricity, cable, Local Authority payments, Littlewoods, Oxendales, A.IB. credit cards and MBNA credit card payments accepted plus many more. Please call for leaflet giving full information. Many Social Welfare payments are paid out through the Post Office e.g. Pensions, Jobseekers, Disability, One Parent, Carers plus many more. These payments are a big part of what the Post Office does. By getting your payment paid through the Post Office you are helping to keep it open for your community. You can now receive your payment and lodge it straight into you A.I.B. bank Account as A.I.B banking is a new service we provide. A.I.B. customers can now lodge cash or cheques straight into their A.i.b. ACCOUNTS. Receive your Social Welfare payment and you can lodge all or some of it straight into you’re A.I.B. account at the same time. Cash withdrawels are also possible. We now offer Foreign Exchange. Sterling and U.S. dollars are available commission free. Try the new Foreign Exchange currency card if travelling to the U.K. or the U.S.A. Operated by Mastercard, it is widely accepted and safer thany carrying cash. Ask one of our staff for more details or call to the P.O. for a User Guide leaflet. You can send or receive money worldwide via Western Union. Need to send money to the U.K., Sterling Drafts are available in £STG for lodgement to bank accounts. Similar to cheques, Postal Money Orders can be cashed all over the country. Personal I.D. is necessary when cashing amounts over €50. An Post now offer a range of flexible and secure Savings Accounts. Competitive Interest Rates are offered and some are D.I.R.T. Tax free, call today for more information. Prize Bonds also available, these can be given as gifts or used as another secure way of investing savings. A €1 million prize is on offer every second month plus weekly prizes. One4all Gift Cards are available for sale. The perfect present which can be redeemed in over 5,300 locations nationwide, including hotels. You decide the amount you wish to give. iTunes cards are also available for sale. Top-ups for all major networks available. International Calling Cards also for sale. We now offer our own mobile phone network, Postfone. Phones and Top-ups available. All of this can be done over the counter in a matter of minutes!